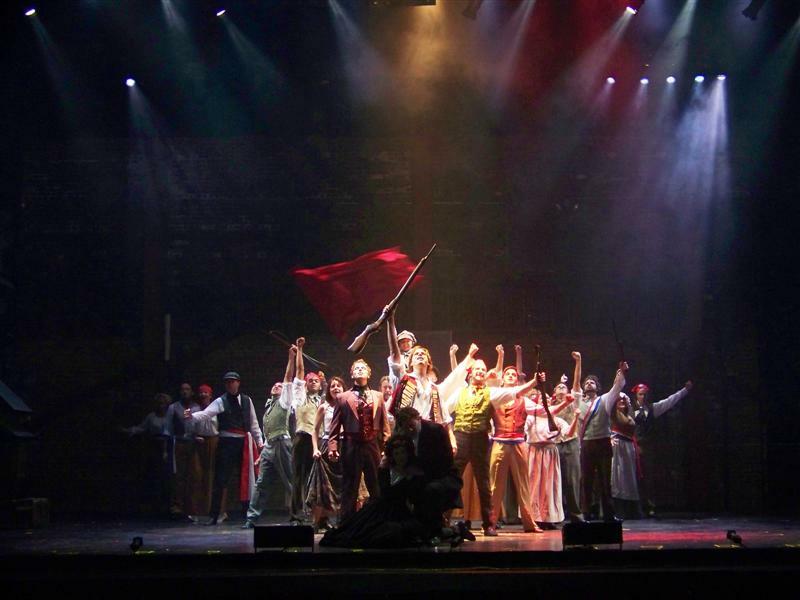 Sung through, Les Misérables opens in a prison in Toulon, France in 1815, where the prisoners work at hard labour (Work Song). After nineteen years of imprisonment (five for stealing bread for his starving sister and her family, and the rest for trying to escape) Jean Valjean, prisoner 24601, is released on parole by the policeman Javert. By law, Valjean must display a yellow ticket-of-leave, which condemns him as an outcast (On Parole). He then meets the Bishop of Digne, who offers him food and shelter. 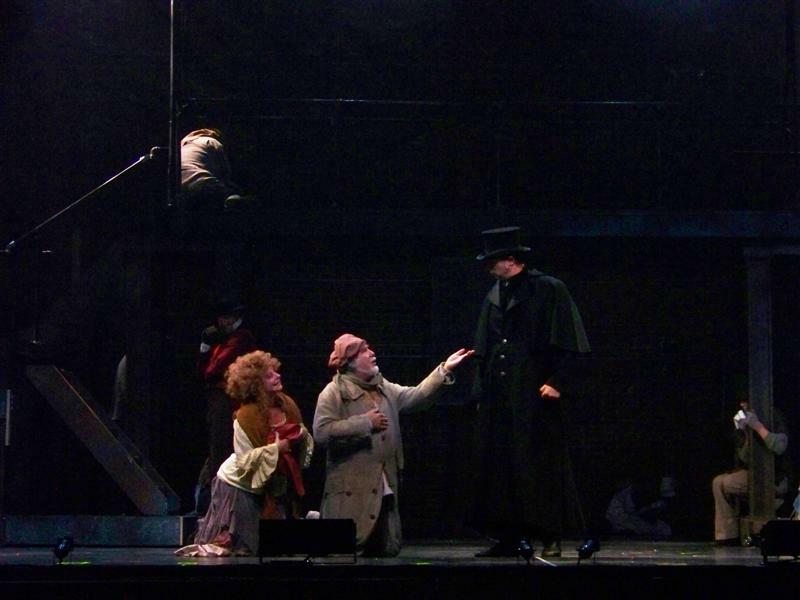 Valjean steals silver from the bishop and is shortly caught by the police. However, the bishop lies to save Valjean and helps him begin a new life (Valjean Arrested, Valjean Forgiven). Humbled by the bishop’s mercy and kindness, Valjean decides to follow the bishop’s advice and breaks his parole. (Valjean Soliloquy / What Have I Done?). Eight years later, Valjean, having assumed a new identity as Monsieur Madeleine, is a wealthy factory owner and mayor of Montreuil-sur-Mer. One of his workers, Fantine, has a fight when the other workers discover she is sending money to her secret illegitimate child who is living with an innkeeper and his wife (At the End of the Day). The Mayor breaks up the conflict, but asks his factory foreman to resolve it. The other women demand Fantine’s dismissal, and because she had previously rejected his advances, the foreman agrees and throws Fantine out. Fantine sings about her broken dreams and about the father of her daughter who abandoned her (I Dreamed a Dream). Desperate for money, she sells her locket and her hair, before becoming a prostitute (Lovely Ladies). When she fights back against an abusive customer, she is arrested by Javert, now stationed in Monreuil-sur-mer (Fantine’s Arrest). “Madeleine” soon arrives, and realising his part in the ruination of Fantine, he orders Javert to let her go and takes her to a hospital. Soon after, when the mayor rescues Fauchelevant, who is pinned by a runaway cart (The Runaway Cart), Javert is reminded of Jean Valjean (who was abnormally strong), whom he has sought for years for breaking parole. However, Javert assures the mayor that Valjean has been recently arrested and will be in court later in the day. Unwilling to see an innocent man go to prison in his place, Valjean confesses his identity to the court—that he is the prisoner 24601—revealing the convict’s brand on his chest as proof (Who Am I? – The Trial). 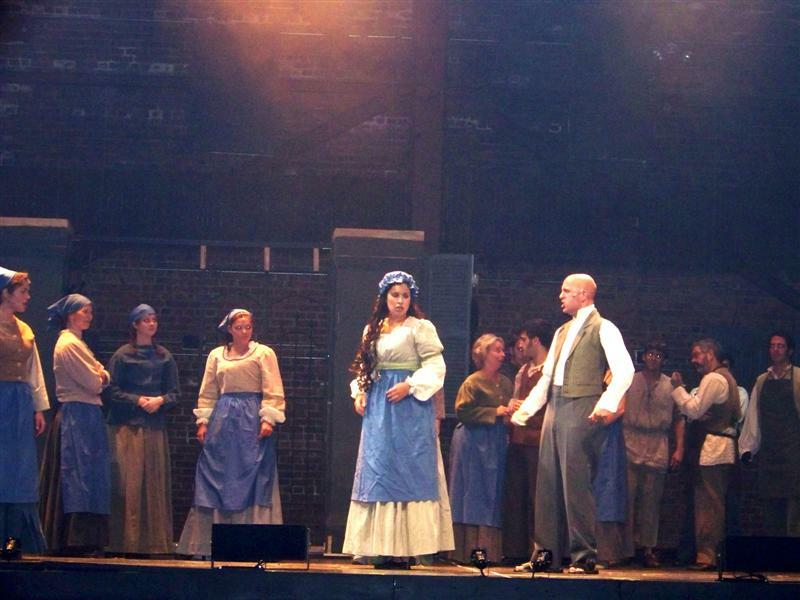 Before returning to prison, Valjean visits the dying Fantine and promises to find and look after her daughter Cosette. (Come to Me / Fantine’s Death). When Javert arrives to arrest him, Valjean asks for three more days to fetch Cosette, but Javert refuses to believe his honest intentions (The Confrontation). Valjean eventually knocks Javert out and escapes. The next scene occurs in an inn at Montfermeil run by the Thénardiers, where Cosette has been living. 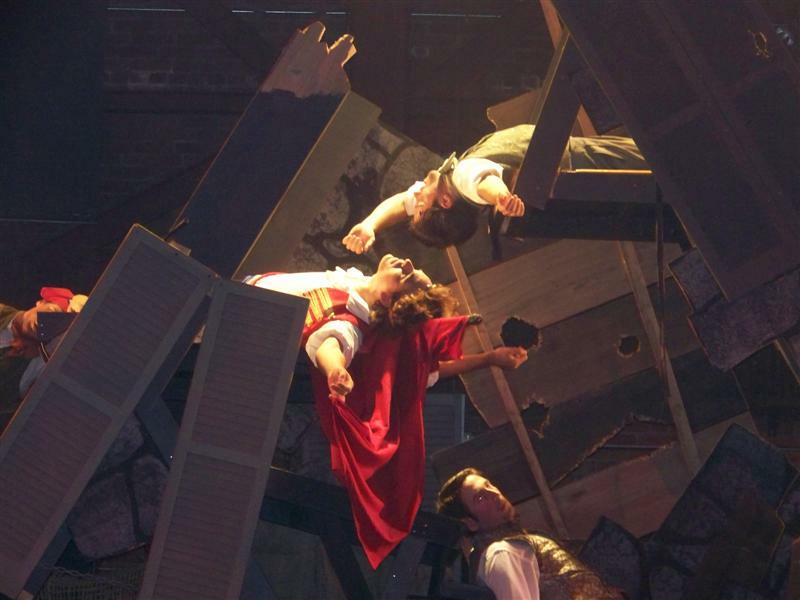 The Thénardiers have been abusing the little girl, while indulging their own daughter, Éponine. Cosette dreams of a better life (Castle on a Cloud) before Madame Thénardier sends her to fetch water in the dark. 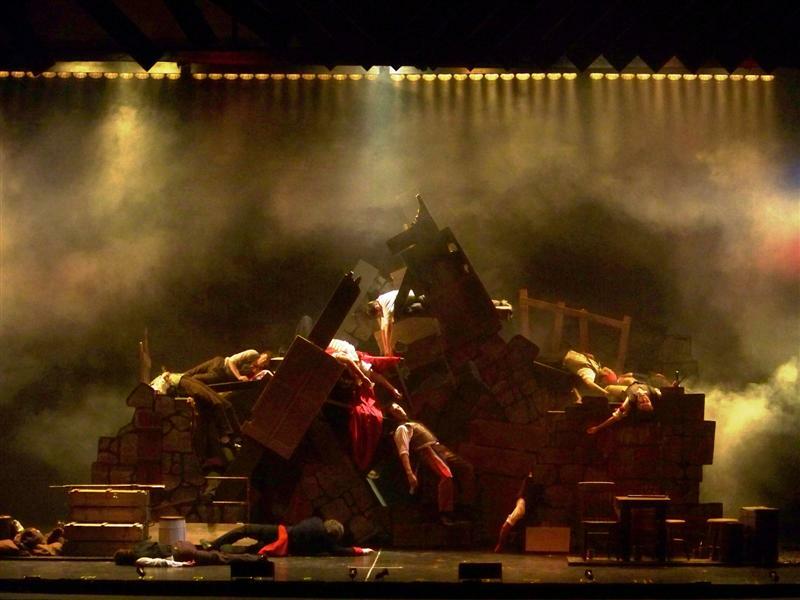 As the inn fills for the evening, the Thénardiers use numerous methods to cheat their customers (Master of the House). Valjean finds Cosette fetching water (The Bargain) and pays the Thénardiers 1500 Francs to let him take Cosette away (The Waltz of Treachery). Nine years later, Paris is upheaval because General Lamarque, the only man in the government who shows mercy to the poor, is ill and may soon die. 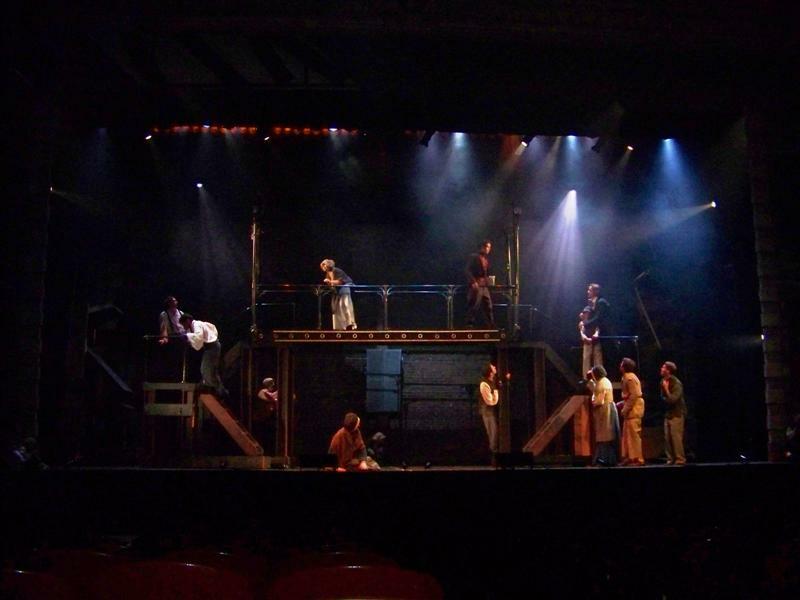 The young street urchin Gavroche mingles with the whores and beggars on the street, while students Marius Pontmercy and Enjolras discuss the likely demise of the general (Look Down). A street gang led by the Thénardiers prepares to ambush Valjean, whom Thénardier recognizes as the man who took Cosette (The Robbery). 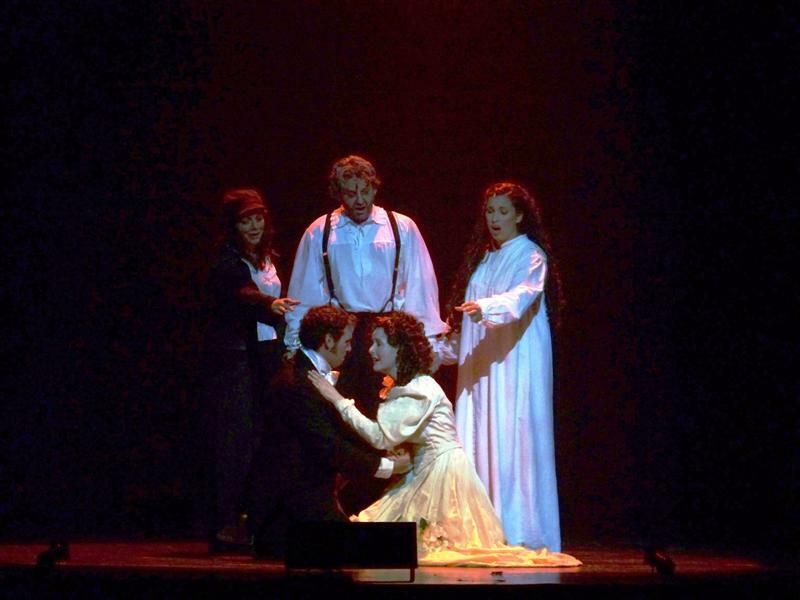 Éponine sees Marius, whom she secretly loves, and warns him to stay away but Marius accidentally bumps into Cosette and immediately falls in love. The Thénardiers’ attempt to rob Valjean and Cosette fails, the result of Javert, who does not recognize Valjean until after he makes his escape (Javert’s Intervention). 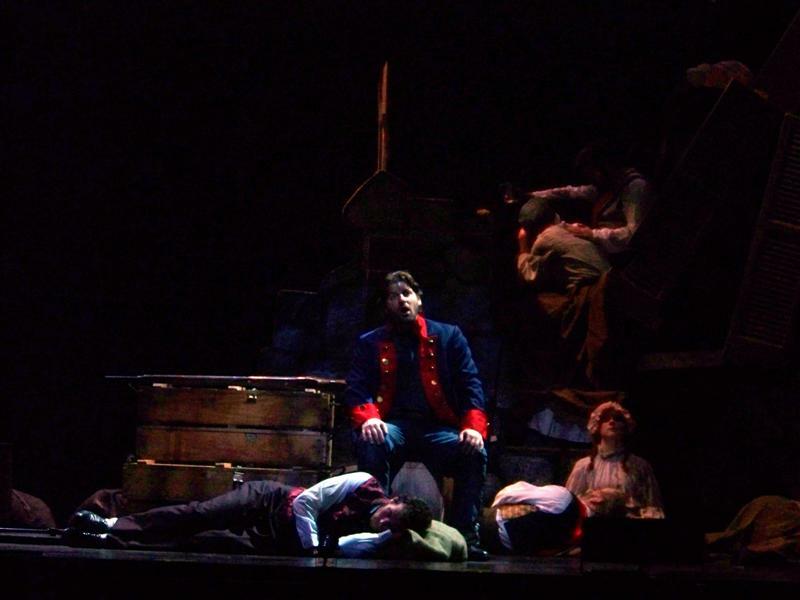 Javert gazes at the night sky, comparing his hunt of Valjean and justice to the order of the stars (Stars). Meanwhile Marius, although he does not know Cosette’s name, persuades a reluctant Éponine to help find her (Éponine’s Errand). Cosette is infatuated with Marius, and although, Valjean realises his daughter has grown up, he refuses to tell her about his past or her mother. (Rue Plumet – In My Life). In spite of her own feelings, Éponine leads Marius to Cosette (A Heart Full of Love), and then prevents her father’s gang from robbing Valjean’s house (The Attack on Rue Plumet). Valjean, convinced it was Javert who was lurking outside his house, tells Cosette they must prepare to flee the country. 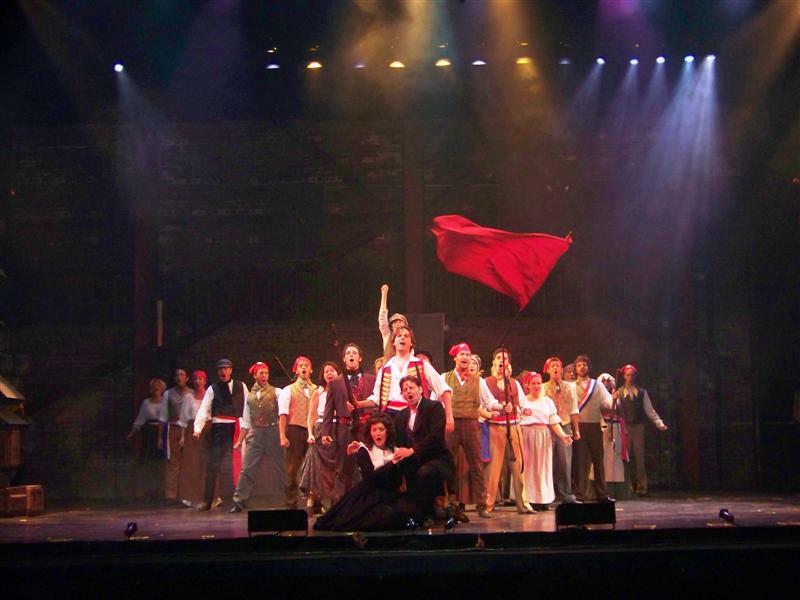 On the eve of the Paris Uprising, Valjean prepares to go into exile; Cosette and Marius part in despair of ever meeting again; Éponine mourns the loss of Marius; Marius decides to join the other students as they prepare for the upcoming conflict; Javert plans to spy on the students and learn their secrets; and the Thénardiers look forward to stealing from the corpses of those who will be killed during the battle to come (One Day More). 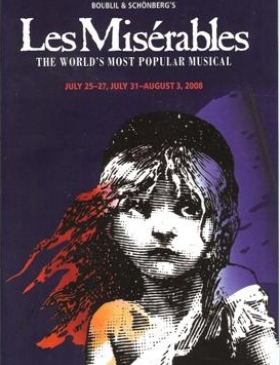 In 1980, Alain Boublil and Claude-Michel Schönberg opened Les Miserables in Paris, a country that has relatively no tradition of musical theater. It sold out and did relatively well, but it was by chance, months after its closure that an English producer heard the French recording and from there led it to its translation into English and brought to the British stage. 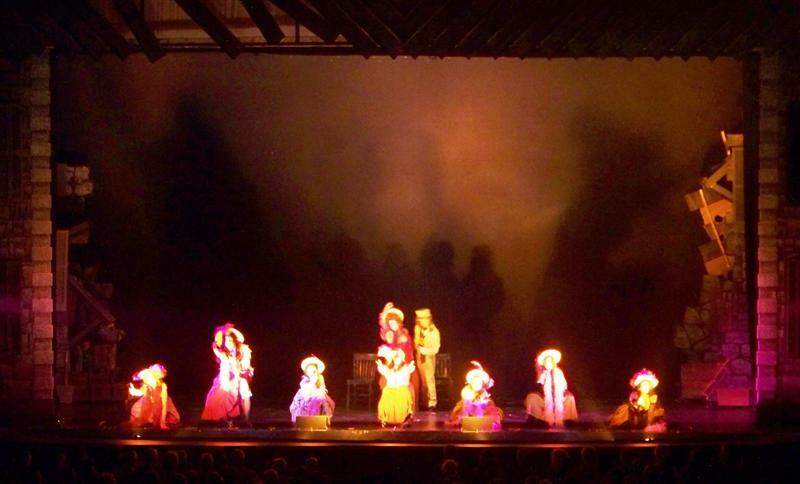 It opened in London in 1985, went on to Broadway and gathered 8 Tony awards, and spawned countless touring companies. However, it was a monstrous effort, condenscing 1200 pages into three acts, entirely in music with no spoken word. They streamlined the story, giving less background information about the characters than Hugo’s gigantic work did, and in fact, less than most of the movies managed. Despite the fact that Marius’s love for Cosette is really the main plot for the musical, little is seen of either student life or artist life. It is mentioned that it is mostly the students who lead the building of the barricades, but nothing is said about Marius’s bourgeois upbringing, or about his grand-father, the Napoloeonic General. The writers did choose to leave the ABC Café, however, though the pun is lost on most of the public especially as it is never said aloud.